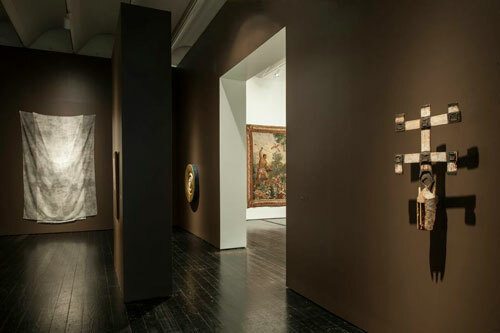 Exhibition curator Glenn Peers brought Byzantine objects together with “like-minded things modern and non-western.” Photo courtesy of the Menil Collection. 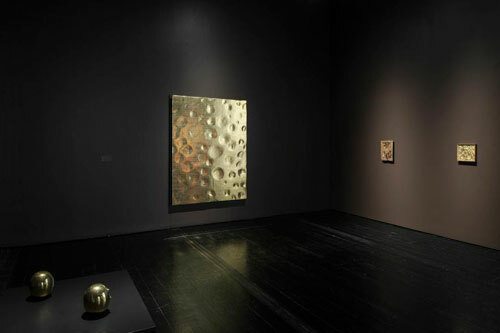 No exhibition in recent memory better exemplifies what the Dominican priest Father Marie-Alain Couturier is said to have told a young Dominique de Menil after her conversion to Catholicism – that a museum “is a place where you should lose your head” – than Byzantine Things in the World. In fact, viagra sale if you don’t lose you head while immersed in this Menil Collection show, purchase which juxtaposes some of the museum’s Byzantine icons, stuff crosses, pilgrim tokens and reliquaries with objects from other cultures and periods, take that as a sign that you need to have your soul examined. I’m also referring to what Peers considers “like-minded” non-western things such as a formidable cow-like boli, or power object, made by the Bamana people of Mali, believed to “emerge and take form in a thick flow of energy known as nyama,” as Sutton writes in the fascinating catalogue. “Everything is infused with it, and an exchange of energetic matter between things is constant. Nyama is an animating force, charging people, the landscape, and objects with life.” A similar kind of animism, Peers says, drove Byzantine thing-makers, which is why the show, for all its cross-cultural eclecticism, includes no Islamic or even Catholic art, making his uncanny fulfillment of Couturier’s mandate for museums an even niftier trick. 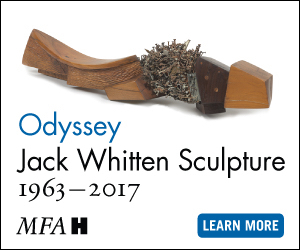 It’s also why he insists on calling the objects he’s assembled – nearly all of which are drawn from the Menil’s holdings – things instead of art. 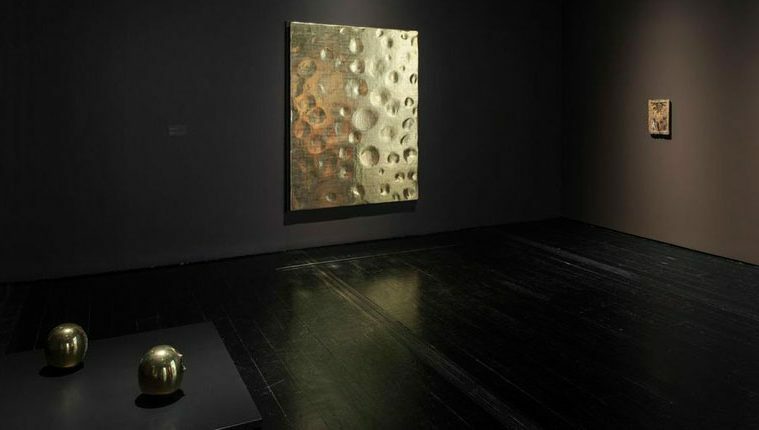 Reminiscent of past Menil shows such as Chance Encounters, the exhibition lives up to Father Marie-Alain Couturier’s ideal of the museum as “a place where you should lose your head.” Photo courtesy of the Menil Collection. Plaque of St. James the Apostle, former USSR, possibly Georgia, 19th century (in 12th century Byzantine style). Gold and cloissoné enamel. The Menil Collection. Only occasionally does Byzantine Things fall into what artist Daniel Buren (who’s not in the show) has called the “exhibiting exhibitions” trap, in which, as he wrote in Frieze in April, “exhibitions are increasingly becoming opportunities for an organizer or curator or whoever to write an essay which usually has nothing to do with the artists invited, but concerns only his or her philosophy about art and society, politics or aesthetics.” While Peers’s essay is convincing on why the sculptor Donald Judd should be considered a maker of “like-minded things” to what the Byzantines made, the Menil’s one Judd, a drab green Formica-like shelf, represents Minimalism at its coldest and most sterile, lacking the essential power other Judds contain. 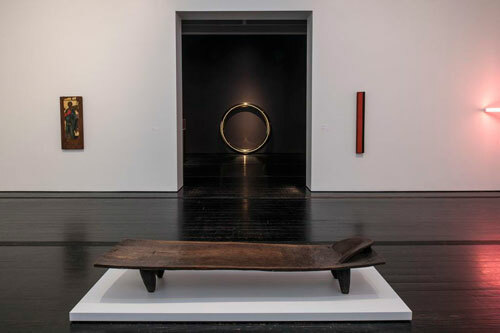 As Donald Rumsfeld might say if he were a curator, “You go to exhibit with the Judd you have, not the Judd you might want or wish to have at a later time.” But who wants Rumsfeld organizing a Menil show?